Deciding to skip church, I felt guilty. Teckie was playing guitar and I have never missed a Sunday of listening to him. However, I hadn't exercised in a couple days and was feeling the need to get out. I knew today would be busy with a friend's birthday and then heading to Santa Barbara for Daniel's 6:45 AM surgery tomorrow. I felt internally pushed to get out and move. I don't know why, but I decided to walk a different path than my usual. Returning home, I crossed over a busy highway bridge, I saw that there were cops up ahead, an ambulance pulling away and lots of commotion. The on-ramp to the freeway was closed. I knew I'd have to walk through the closed-off intersection to get back home. Approaching, I saw a crunched-up bike in the street. Many witnesses stood around. To my left was a young girl, sitting on the curb. I looked at her and realized ... I know her! This is my friend's daughter! I sat down next to her and hugged her. She had hit the bicyclist that was taken to the hospital. She was alone and clearly in shock. I held her while she let it out and then called her mom. Not a happy call to make. 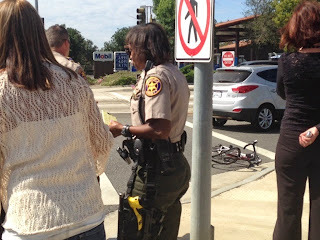 Police interviewed her and then we waited. We prayed together and I talked her through deep breathes. I was shaken up; I can't imagine how she felt. Why did I walk a different path and ditch church? The guilt of missing church lifted as I comforted her, as maybe God wanted me somewhere else? Ten minutes after her Mom arrived I continued my walk home. Shocked over what just happened, it reminded me that God is in the middle of all things and providing for us in unimaginable ways. I will depend on that as Daniel goes into surgery tomorrow. God has already worked out the details, I just have to trust.